Before the war, Ana (66) and Fabijan (62) Tokmakcija were living in Kakanj, Bosnia and Herzegovina in their family house. In June 1993, the three-member family fled to Vares, BiH. Soon after, Ana and Blazenko (40), their son, were evacuated and resettled in an organized accommodation for refugees and displaced persons in Novigrad, Istria. Fabijan re-united with his family in December 1993. In 1995, Tokmakcija family repatriated to Drvar where they moved into a deserted house. Upon the return of the owner in 2002, they had to leave the house. Having no place to go to, they departed again to Croatia and settled down in Knin. Since their arrival, they have been living in rented accommodation, switching and renting apartments below basic living standards. For the last couple of years, they have been accommodated in an apartment located in an old and ruined building, abandoned by all other tenants. The building does not have an elevator so they have to climb 25 stairs to get to the apartment. This is, besides the inadequate condition of the apartment and the building, the main obstacle for a normal, decent living, especially for their disabled son Blazenko. In 2006, Blazenko was diagnosed with multiple-sclerosis. At that time, he was still working but due to the progress of his illness, he retired in 2010. Blazenko receives a disability pension from the Croatian Pension Fund and some supplementary benefits for nursing and care from the Centre for Social Welfare. 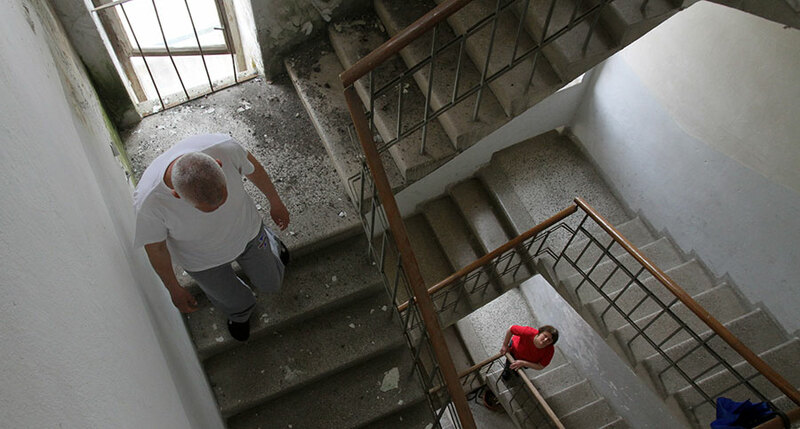 Blazenko leaves the apartment only when going to regular medical check-ups and treatments, and he has to be carried in-out by medical staff, otherwise he remains imprisoned in his room. Since 2014, Blazenko has been fully dependent on the help and assistance of his parents. His father also has several health problems, including hearing problems. Ana Tokmakcija had to have eye surgery and has a limited eye sight. In October 2017, the Takmakcija family moved into one of the apartments in the new RHP-financed building in Knin, Croatia. Blazenko said that his life will no longer be a prison; he could perhaps start living again.